If you’re searching for grinders to invest in you’ve probably come across many different brands you can choose from. While having a wide selection is great, it can also be a little daunting. Which brand is the best? Does the brand really make that much of a difference? Brands actually make a huge difference because they each have their own quality and unique designs. However, sorting through the numerous brands can be difficult which is why this article was written. Below you’ll find some helpful tips as to how you can find the best grinder brand for your needs and some products from the top grinder brands on the market today. What are Some Brands I Should Look For? There are plenty of brands that are great to buy grinders from. Some of the top ones include Space Case and Zip Grinders which make high-quality and durable products for you to use. Below is a little more behind some of the top 10 grinder brands you can buy from. 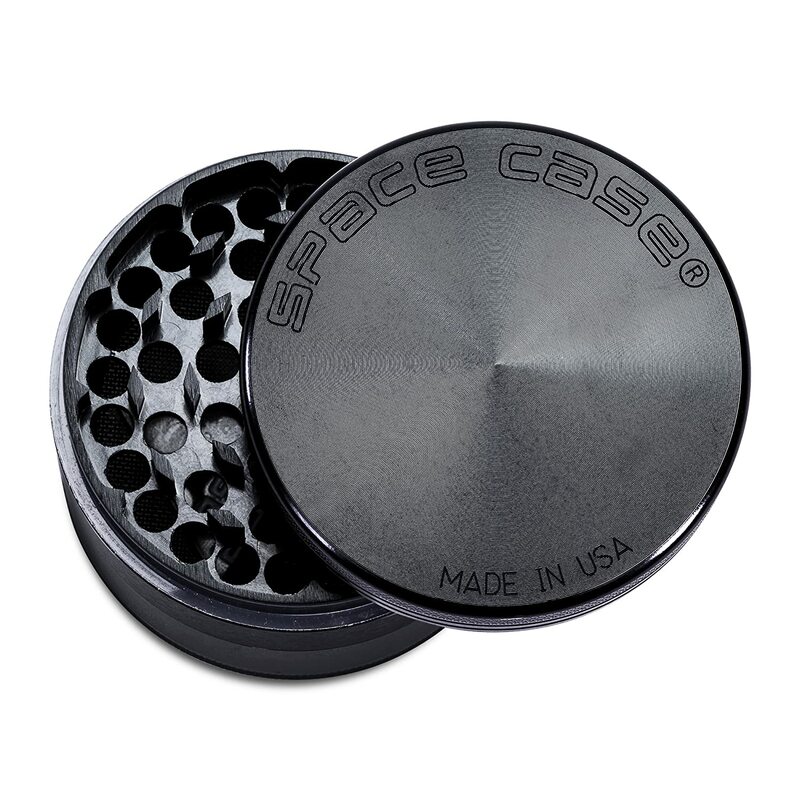 Space Case offers many different grinder types which makes it a great brand to buy from if you’re looking for a variety of choices. 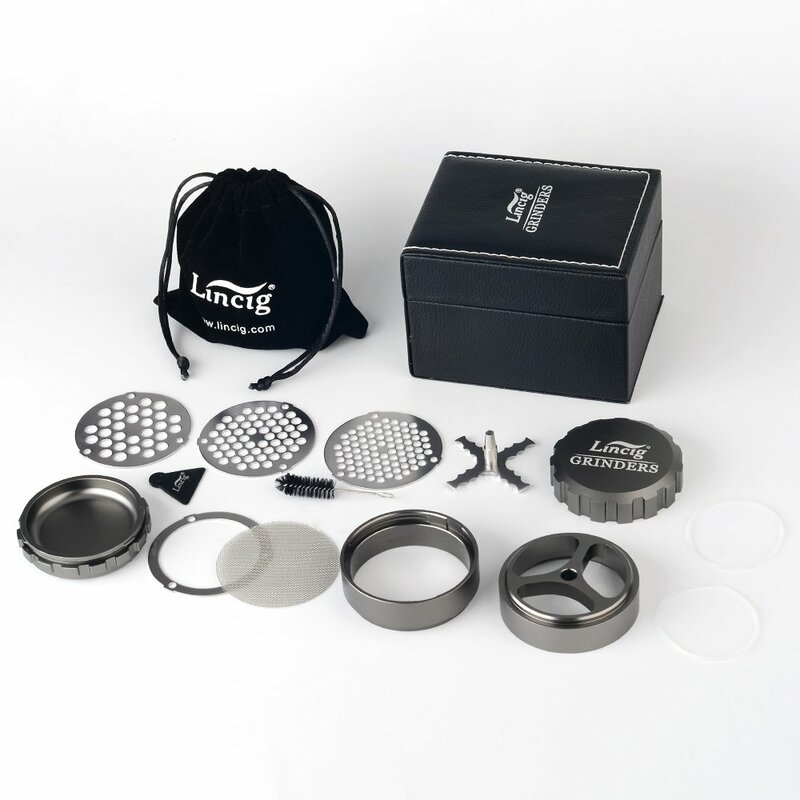 They offer 2, 3, and 4 piece grinders that come with materials and finishes like titanium and magnetic lids. They even have unique scout grinders you can buy. Space Case Grinders comes in many different colors and this brand sells helpful products you can use to clean your grinder with, like pollen picks. Created in San Francisco, Golden Gate Grinders were named after the iconic landmark in this city. While it only offers one main grinder design, Golden Gate Grinders are made with a durable aircraft-grade aluminum and come in a few color choices. You even have the ability to choose between a small or large container for your grinder. The brand offers many helpful tips on its site you can use to help keep your grinder in tip-top shape, like cleaning advice and how to take the pieces apart safely. This brand is unique from others as its grinders are created with CNC technology and are anodized, so their finish stays completely on the grinder itself and doesn’t peel off. 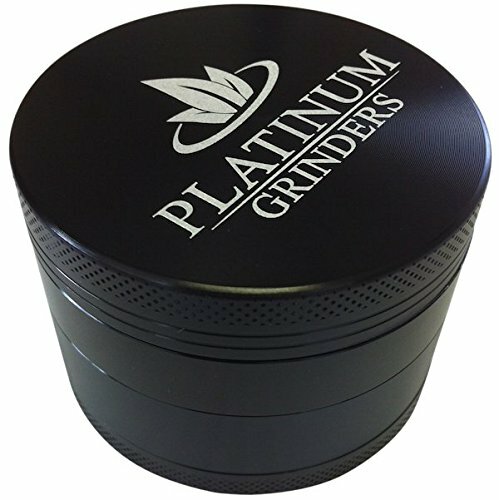 Platinum Grinders offers affordable products that have heavy-duty materials and come in a variety of sizes. Santa Cruz tends to be an expensive brand, but this is because their grinders are made of high-quality materials. These grinders are very durable and have sharp teeth that are designed to stay sharp and not become dull. 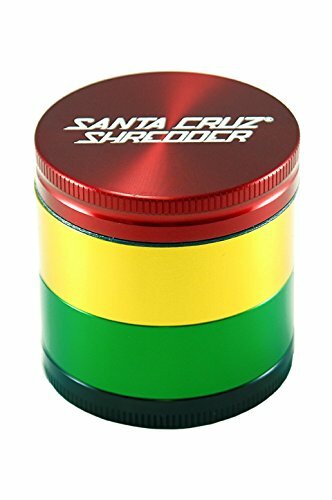 Santa Cruz’s grinders are easy to use and come in many different options, like 2, 3, and 4 piece models and are made with plenty of unique designs you can choose from. Santa Cruz even sells accessories you can use with your grinder, like scrapers, to keep them clean to help them last. Kingtop is a somewhat new brand to the market. It offers 4 piece grinders that come in colors like black and red. This brand also has a strong screen built into their grinders to help sort through the contents inside so you get a fine and clean grind. Cali Crusher Grinders are based in California and offer a variety of grinders you can choose from. Cali Crusher has 2 and 4 piece grinders as well as ones that have cranks on the top of them. There are also plenty of colors and sizes you can choose from with this brand so you have a wide selection to choose from. 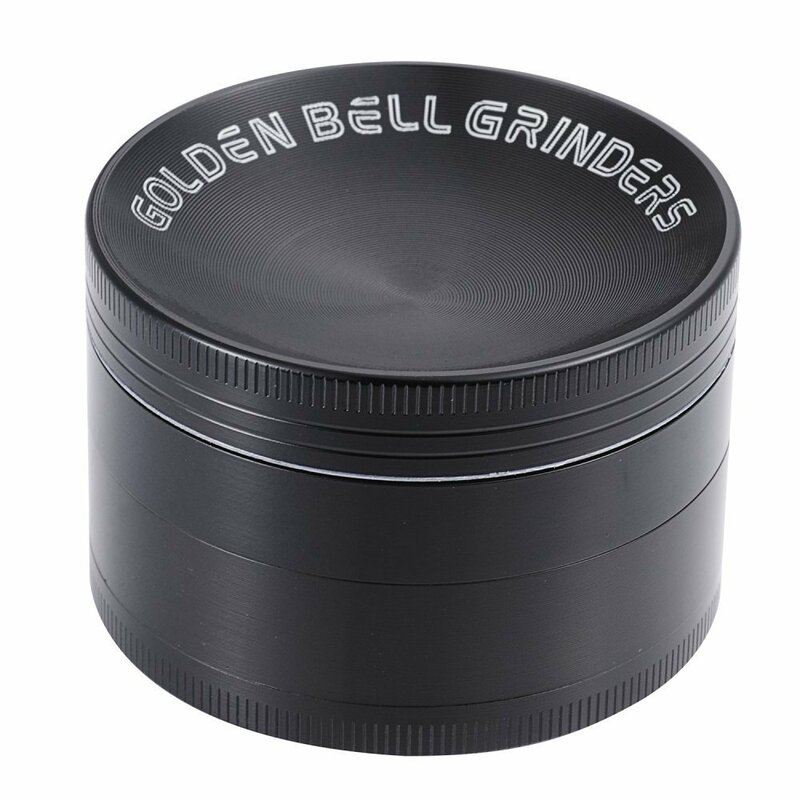 Golden Bell designs grinders that are affordable yet durable. Their 4 piece grinders come in many styles and finishes so you have plenty of choices. Zip Grinders is one of the top brands to buy grinders from due to their high-quality products. This well-known brand is popular for its creative art designs gracing the lids of its grinders. They also offer many stunning grinder designs, like Pagoda Tower grinders and Mega Crusher ones. In addition to this, Zip Grinders also offers many grinder accessories, like jars you can keep your grounds in so they stay fresh. Sharpstone Grinders is an affordable grinder brand that’s known for its colorful assortment of grinder products. You’ll find 2, 4, and 5 piece grinders as well as grinders that have crank tops on them. Some of their grinders even have pollen presses built into them to help keep the pollen out from the materials inside. While not all products are highly priced, a few are. This is often due to the products having well-made parts that last a long time and don’t wear out easily. While it might be a costly investment at the time, it will be worthwhile because your grinder will last. However, many great grinders come with affordable prices so you have a wide affordable price range when shopping for one. It’s important though to keep the price in mind so you aren’t overwhelmed by the vast price range so you buy one that will fit your budget. Something interesting about many brands is that they each try to make their own mark on the market by creating unique designs that other similar products don’t have. This can be the shape of the grinder for instance. Some might have a sleek curved design to help make twisting the grinder around easier while others have a creative lid twisting feature. Other unique designs you might find in some brands are extra teeth, stunning color combinations, and chambers which sort through the grounds. Depending on your needs, you’ll want to look carefully at the size of the grinders. The best brands come with a variety of grinder sizes you can use. If you plan to carry your grinder around, you’ll want to look for a smaller grinder. However, if you plan to grind quite a bit of materials up you’ll more than likely want a larger size. Sometimes extra materials will come with your grinder, like a pollen scraper or carrying bag. These are not only nice to have but can make your grinder last for a long time. Because of this, you’ll want to look carefully at the brands and their grinders and see if they include materials like this with your purchase. Many grinder brands offer grinders with crank tops. This is where instead of twisting the lid itself to grind the materials in it up, you can use a small crank which is built into the top of the lid. This can sometimes be easier for some people to twist the teeth inside rather than having to hold the grinder tightly and twist it around with both hands. So, you’ll want to consider crank tops if you’re looking for a smoother way of grinding the materials inside the grinder up. Pollen screens are very important to look for in grinders because they are what will help to make the materials you grind useable or not. These screens will sort out the pollen in the cannabis and remove it which is very helpful. When searching for a pollen screen in these products also ensure that they can be removed from the grinder safely so you can clean them off. When shopping from these brands you’ll find many different materials that they’re made of. Below is a little more about what they are and how they can impact your grounds. Wood is a unique material to use with grinders. Wooden grinders usually come in 2 pieces and are easy to twist around. They also have a nice natural look to them. However, wood isn’t necessarily the safest material to use because of its treatment and teeth which tend to be made out of bulky nails. If you’re looking for a very cheap grinder it will more than likely be made of acrylic. While the price might be lower, acrylic grinders aren’t the most durable and chip very easily so you’ll more than likely end up having to invest in a new one after a short time. Aluminum is probably one of the most popular materials to use with grinders. It’s durable and can withstand plenty of heavy-duty usage. The teeth inside also tend to stay very sharp which is ideal. However, aluminum can sometimes be a little heavy compared to other types so if you plan to transport the grinder around you’ll want to keep this in mind. The Space Case Grinder is made up of 4 pieces and covered in a stainless steel titanium. Its medium size will allow anyone to carry it around easily in their pocket without problems. This grinder’s lid features strong magnets which help to keep the top secure to the grinder when you’re twisting it and prevent odors from escaping. As you twist the lid, it will activate the grinder’s sharp teeth to start rotating. These teeth will work to grind the contents up well to a fine grind. The materials will eventually fall through a sift screen in the grinder which will help to sort through the contents and remove pollen from the mix. Any pollen found will be stored in a special pollen collection chamber in the bottom which you can later remove. This grinder is somewhat expensive, but it’s made to be very sturdy and durable which is worth the price. This Golden Gate Grinder measures 2.5 inches and is made up of 4 aluminum pieces with are coated in a nice black finish. It features textured grips on the side which are designed to help keep your hands steady as you twist the lid. The lid has strong magnets built into the top of it which helps to keep the lid on secure to the grinder and prevent materials inside from escaping. These magnets help to make this grinder extremely odor-free which makes it ideal for those who want to carry the grinder around with them discreetly. Inside the grinder you’ll find plenty of sharp teeth and even extra pairs to help give the materials a better grind. There is also is a micron stainless steel mesh filter which works to help sort out the contents to prevent large, chunky pieces and pollen from getting mixed in. If there’s any pollen, it will be sent into the grinder’s pollen chamber where it will stay until you remove it. The Golden Gate Grinder is very durable and works quietly so you won’t have to worry about it making loud noises when using it. 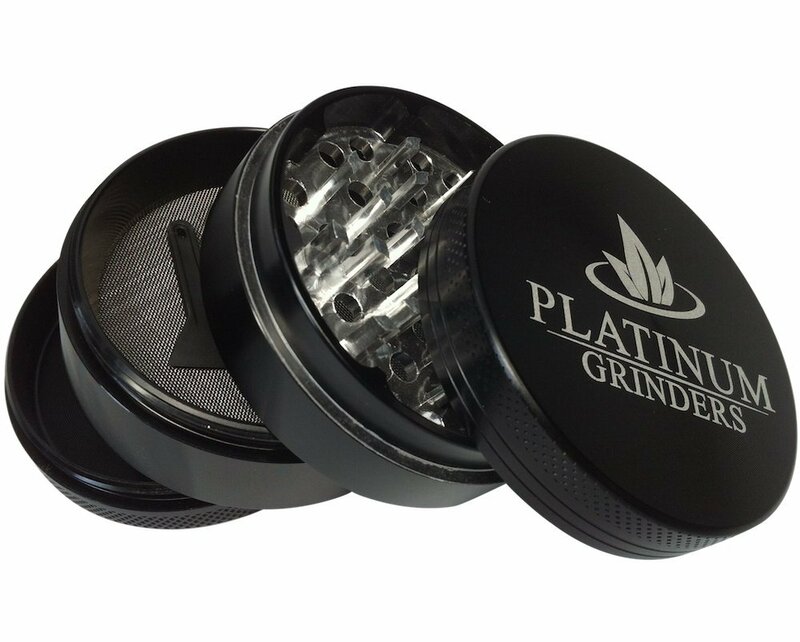 This large grinder by Platinum Grinders measures 2.5 inches and features 4 aluminum pieces all coated in a sleek black finish. It’s a very durable grinder so you wouldn’t have to worry about it breaking or scratching easily. 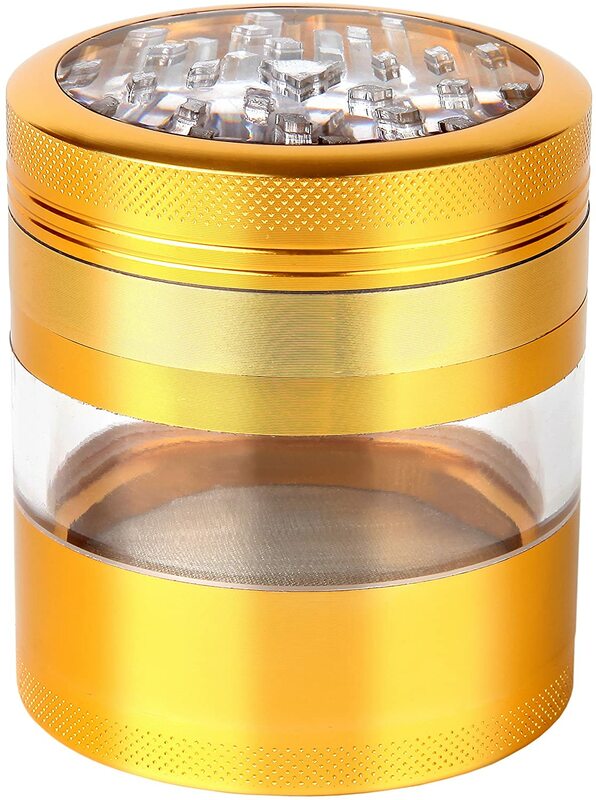 This grinder features over 49 diamond teeth which are sharp enough to quickly grind up the materials inside. In fact, these teeth are so sharp that you’ll be able to get a fine grind in seconds. The grinder’s lid has magnets built into it which helps to keep it secured tightly to it so it doesn’t accidentally slip off. There are also textured grooves on the side which can help you to keep your grip steady when twisting the lid around. Inside this grinder is a pollen catcher which helps to prevent pollen from mixing into the materials inside. 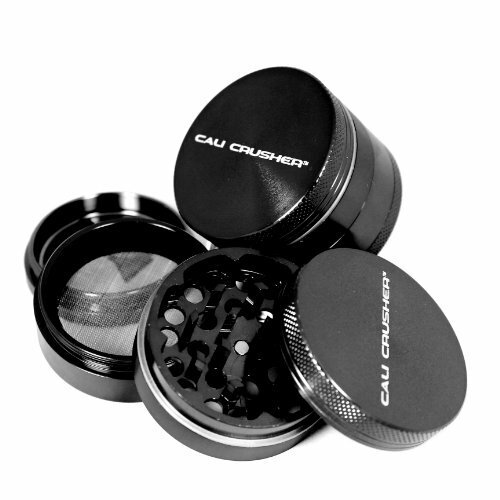 The Cali Crusher Grinder is made with a black design and comes with 4 pieces. It’s a smaller grinder which makes it perfect for those who want a portable grinder to invest in. Inside this grinder are sharp teeth which work to quickly grind up the materials inside. There is also a micron screen which will sort through the contents being grounded to prevent large pieces and pollen from getting mixed into it. The Santa Cruz Shredder is a very colorful option and great for those looking for a unique design to have for their grinder. Coated in a Rasta colored design, this medium-size grinder is made up of 4 aluminum pieces. One piece is the lid which features strong magnets in it to help keep it secure on the grinder when you twist it and also to prevent odors from escaping. On the bottom of the lid are many sharp teeth. While most grinders use teeth, the Santa Cruz brand has a special tooth design incorporated into theirs. This unique design includes 3 rows of teeth in the front of the lid rather than one. This extra row will help to speed up the grinding process and give you a finer grind. Other pieces you’ll find inside this grinder are a stainless steel sift screen and pollen catcher. These two pieces will work to sort through the materials being grounded to prevent large pieces and pollen from mixing into the other contents so you get a fine, even grind. If you’re someone who wants to collect kief, you can rest assured that this grinder stores it well and it will stay fresh for a long time. This Santa Cruz shredder is a small grinder, but works just as powerfully as a larger version. Because of its small size, it makes it a perfect grinder for those looking for a portable option to invest in. The Santa Cruz Small Shredder is made up of 4 pieces each of which are coated in a shiny black finish. It features a magnetic lid to help keep odors from escaping and to secure it to the grinder when you’re twisting it around. It also has a sorting screen which helps to sort through pollen and larger pieces so they don’t get mixed into the fine materials. This grinder even comes with a pollen press. If you’re looking to get a very fine grind this is a great grinder to consider. However, keep in mind that it’s a little on the more expensive side. 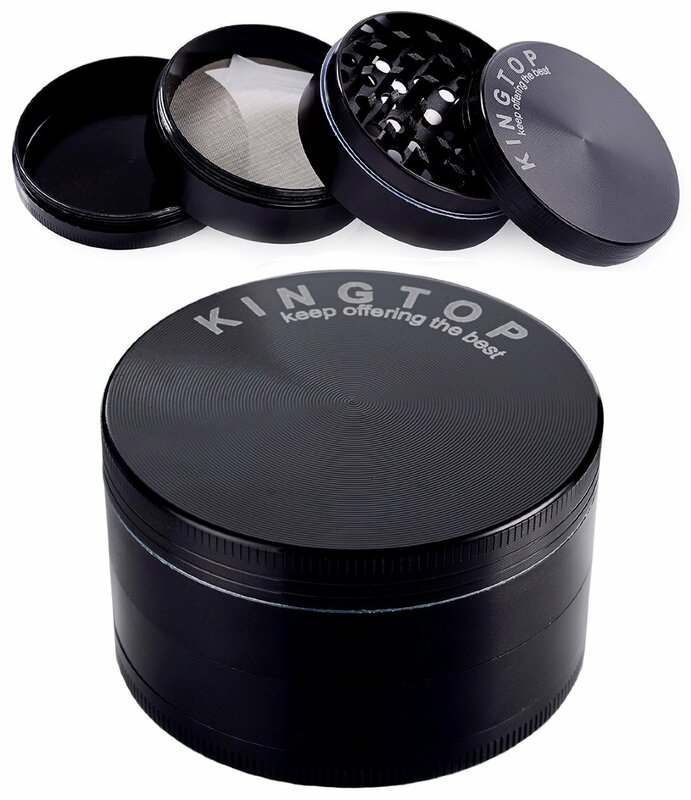 The Kingtop Grinder is made with a large design and measures 3 inches. It’s coated in a stylish black coating and was created to be very easy to use. To help with this, it includes a smooth twisting function to help make moving the lid around to the grind the materials inside hassle-free. On the top of this grinder is a magnetic lid which not only helps to make twisting the lid easier, but prevents odors and keeps the materials inside fresh. Inside the grinder is a pollen screen which helps to sort out the materials inside to prevent them all from mixing together. The teeth built into the grinder are sharp which help to give you a fine grind. These teeth are also designed to stay sharp for a while so they don’t go dull quickly which could otherwise impact the quality of your grounds greatly. The Golden Bell Grinder measures 2.4 inches and is made out of zinc alloy that is coated in a black finish. This grinder is made to last so you don’t need to worry about it breaking or scratching easily. The lid of the grinder is made with a special concave design which helps the teeth inside work better at grinding up the materials inside. The interior of the grinder has numerous diamond-shaped teeth which work quickly and quietly to grind the contents up. As the teeth grind through the contents, the materials will fall through a screen to help sort through them to prevent bulky parts or pollen from mixing in. This grinder is lightweight so it’s great to transport around. This Zip Grinder is made with a very elegant design. It’s a large grinder created out of a heavy-duty aluminum that’s coated in a gold finish. However, don’t be fooled by the delicate design, this grinder is very durable and its stylish finish won’t scratch easily. The grinder is made up of 4 pieces and measures 3.3 inches. The middle piece is made out of a clear plastic which allows you to watch the materials inside being grounded and sorted through. On the top of this grinder is a magnetic lid which will help you to twist the teeth inside easily and prevent odors from escaping. The magnets also help to keep the lid secure to the grinder so air doesn’t leak into it and dry the materials inside up. This grinder features over 49 diamond teeth which work quickly and quietly. As the teeth grind the contents up, they will fall through a pollen catcher which will remove all traces of pollen from the materials. This grinder can also serve as a pocket grinder which makes it perfect for those who want to carry their grinder around with them. 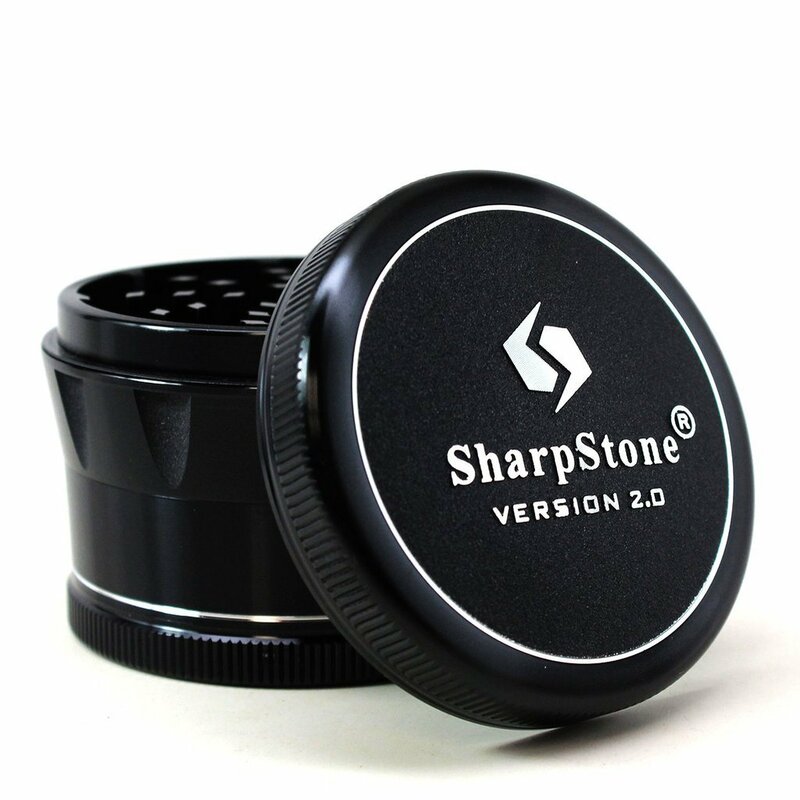 The Sharpstone 2.0 Grinder features a black housing and is made up 4 pieces. It’s made with a unique curved design which was created to help make grinding materials easy. This curved design helps to keep your grip steady when you’re twisting the lid around to prevent the grinder from slipping so you get a more even grind. On the top is a lid filled with strong magnets to help keep it secure to the grinder when you twist it around. The grinder features many diamond-shaped teeth which are very sharp and work quickly to grind the materials inside up. As the teeth work to grind the contents up they’ll be sorted through by a pollen screen which will remove any pollen from the mixture and send it into the grinder’s pollen chamber. 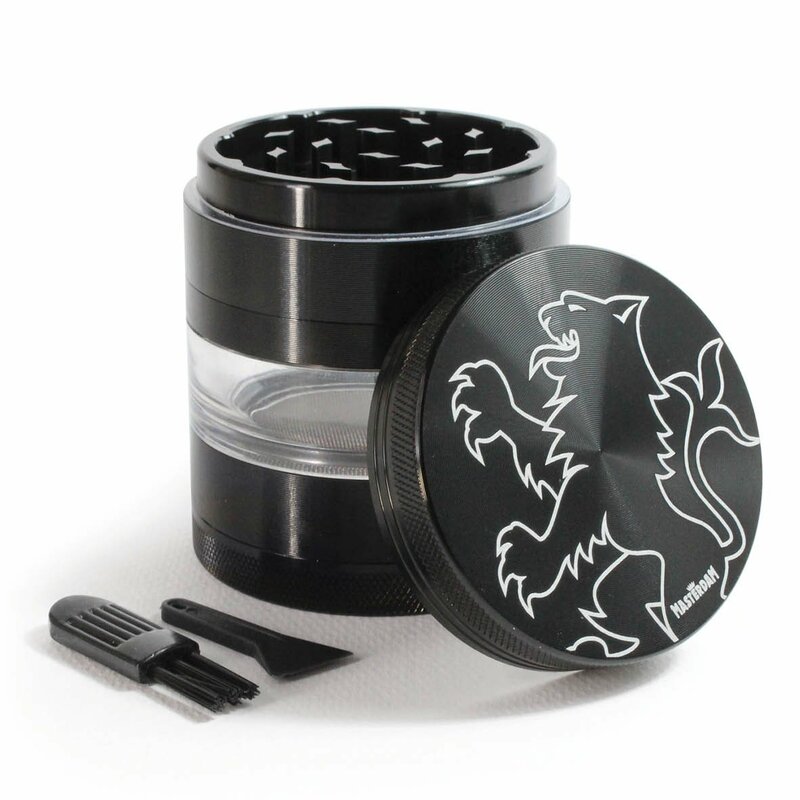 This grinder comes with a pollen scraper and carrying bag you can use to carry it around in. This Masterdam Lion Series grinder is made up of 5 pieces all of which are coated in a black aluminum coating. This coating is made of a durable paint so it won’t scratch off easily. The interior of this grinder is made up of many intricate parts, including a removable pollen screen. This screen will filter out the pollen when you grind your leaves up to prevent them from getting mixed into it. As you grind the leaves, they will fall through a filter and into a special chamber where they will be collected. You can keep track of how full the chamber is thanks to its clear window. This grinder’s interior is coated in a non-stick nylon which will prevent the leaves and other particles from sticking to it. The 12 sharp teeth inside will work to cut up the leaves into minute pieces through the grinder’s 24 holes where they will be further ground up. As you twist the lid you’ll find that it won’t slip off like some other grinder models. This is due to the strong magnets built into it which help to keep it in place so it doesn’t slip. This model comes with a travel pouch you can store your grinder in and a cleaning brush. 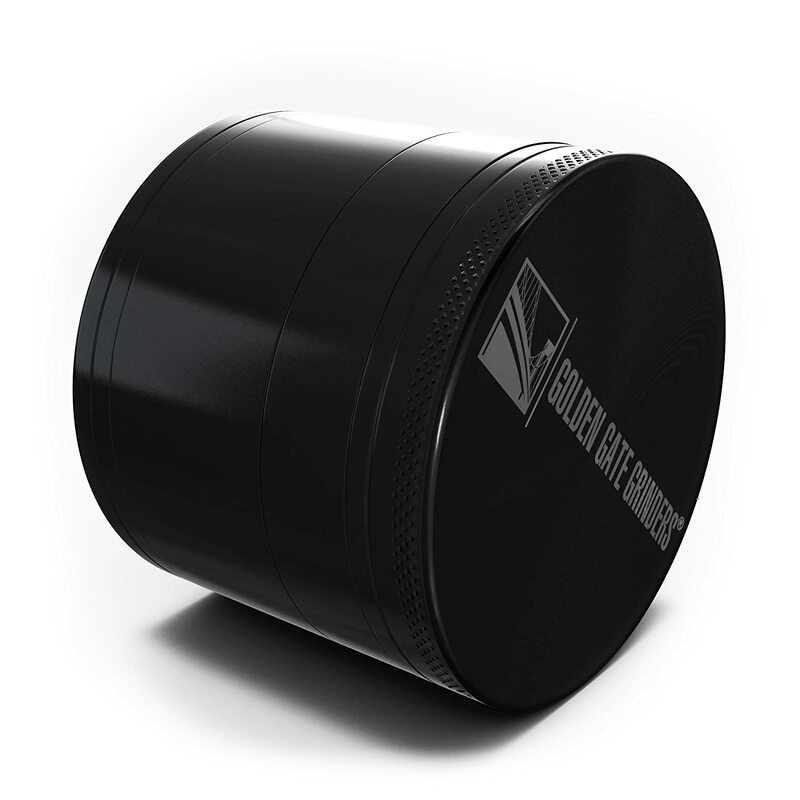 This unique grinder is made of a strong metal construction that’s coated in a sleek black paint and has a beautiful flower imprinted on the top of the lid. This paint is scratch resistant so unsightly marks won’t appear on it. The DCOU Premium Grinder is made up of 4 pieces all of which can be detached so you can transport the grinder around or clean it. The grinder measures 2.2 inches across and has 3 special chambers in its interior. These chambers will work to filter out the pollen and leaves so the finished result is perfect. Inside you’ll find a specially made pollen catcher to aid with removing the pollen from the leaves. There’s also a stainless steel mesh screen filter to help prevent any other particles from escaping and mixing into your leaves. The 54 diamond teeth this product has will get right to work quickly (and quietly) ripping the leaves up so they are good to use. These teeth are durable and extremely sharp so you won’t have to worry about spending an excessive amount of time using this grinder. This premium grinder comes with a pollen scraper and works as a pocket grinder you can transport around when on the go. 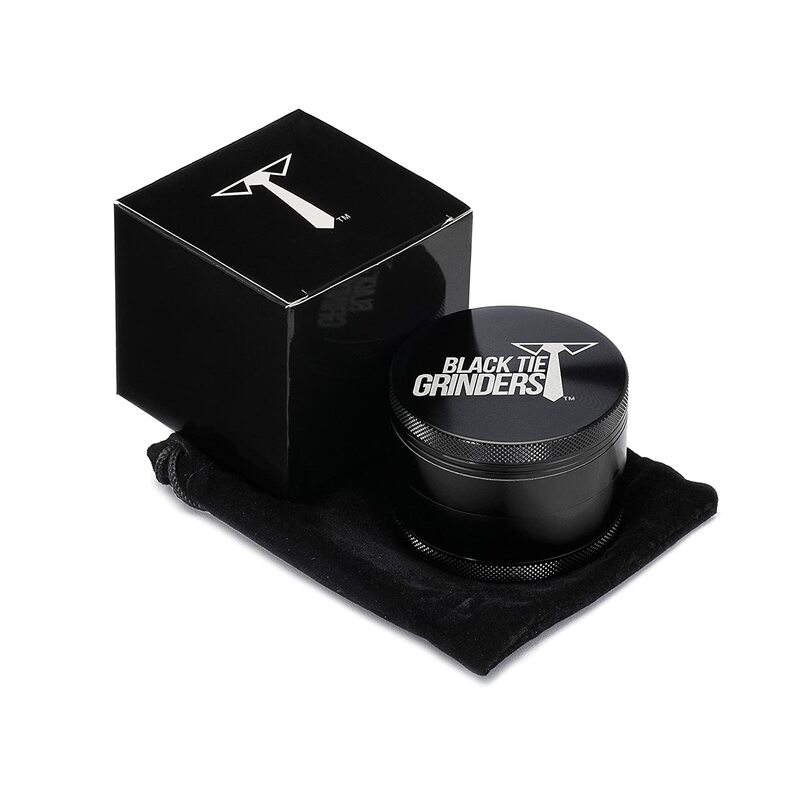 The Platinum Grinders Herb Grinder is one of the top products when it comes to grinding up your leaves. It’s large and made of a strong aluminum construction which helps to make it very durable. This construction is also scratch resistant which helps to prevent scratches and other marks from occurring to the finish of the grinder. This grinder is made up of 4 pieces. One of these pieces is a slip-free lid that has grooves carved into it. These grooves will help you to keep a tight grip on the lid when twisting it around so the leaves can be cut better. The lid also has magnets built into it to help prevent it from coming undone while you’re in the middle of using it. Underneath the lid is a specially designed ring which helps with ensuring a smooth grind. Inside this grinder are 49 diamond teeth all of which are sharp and work quickly to rip up the leaves. A pollen catcher screen is built into the interior as well to help sort the pollen from the leaves. In addition to this screen are stainless steel mesh filters which help to ensure that nothing else ends up in your leaf mixture. This grinder comes with a pollen scraper which you can use to help clean the pollen catcher screen. The Golden Gate Grinder measures 2.5 inches across and is made with a sleek black design (it also comes with a silver option as well). This large grinder is made of an aluminum housing which is extremely durable so you can easily use it and transport it around without problems. The housing is extremely scratch resistant so you don’t need to worry about it being damaged easily. The lid of this grinder has magnets built into it to help it stay on the top chamber when being twisted. There’s also a ring underneath the lid which helps to ensure the grinder works smoothly and isn’t loud when in use. You can use the grooves on the side of the lid to help turn it around so the diamond teeth inside get to work chopping the leaves up. As the teeth cut the leaves they will send them into the chambers below. With the pollen catcher, the pollen will be collected in one chamber while the leaves will be collected in another. There’s a stainless steel mesh filter built into this grinder as well which helps to ensure nothing bad gets through. This model comes with a pollen scraper you can use to remove the pollen. The Zip Grinders Herb Grinder is made up of 4 pieces. 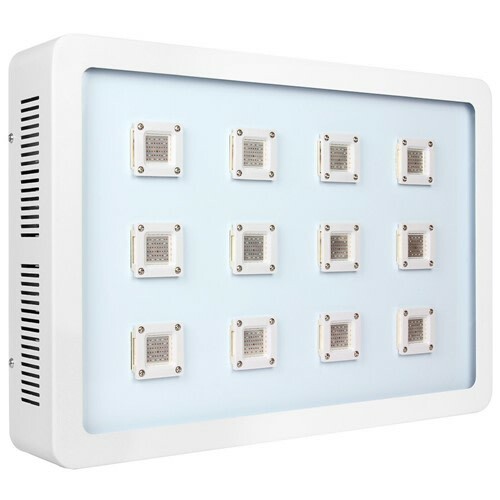 These pieces are made out of an aluminum housing and have a black coating on them. The lid of this grinder features strong magnets which help it to stay securely on the grinder when in use. The interior has a pollen catcher to help remove the pollen from the leaves that have been grounded up as well as a mesh screen to help add an extra level of protection when filtering out the items. This grinder features 49 sharp diamond teeth to help grind up the leaves and a clear chamber which you can use to keep track of how much you have ground up. This durable product has a removable chamber so you can use it as a pocket grinder and also comes with a pollen scraper you can use to remove pollen from the pollen catcher. The Black Tie Grinder measures 2.5 inches wide and is made with a strong aluminum housing that is coated in a sleek black paint. You’ll notice that this grinder’s 4 pieces fit together quite nicely thanks to the CNC technology built into it. This technology ensures that the pieces are secure and properly fit into each other so they work to correctly grind up your leaves. Build into this grinder are 50 sharp diamond teeth that work quickly and quietly when ripping them up. After the teeth grind them up, the leaves and other particles will fall into the 3 chambers below. Each chamber will filter out a certain part, like the leaves and pollen. The pollen chamber will collect the pollen and store it away until you need to remove it. The leaves will then continue to fall and be further sorted through by a micron steel mesh filter to make sure no other particles are mixed in. To activate these chambers you need to twist the grinder’s lid. This lid is easy to use and has magnets built into it which help to secure it better to the grinder. Included with this product are two pollen scrapers and a pouch you can use to store the grinder in. This Green-Der Gold Grinder features a beautifully designed aluminum housing that’s coated in a shiny gold color. However, if you prefer a different color you also have a choice between black, red, and silver. 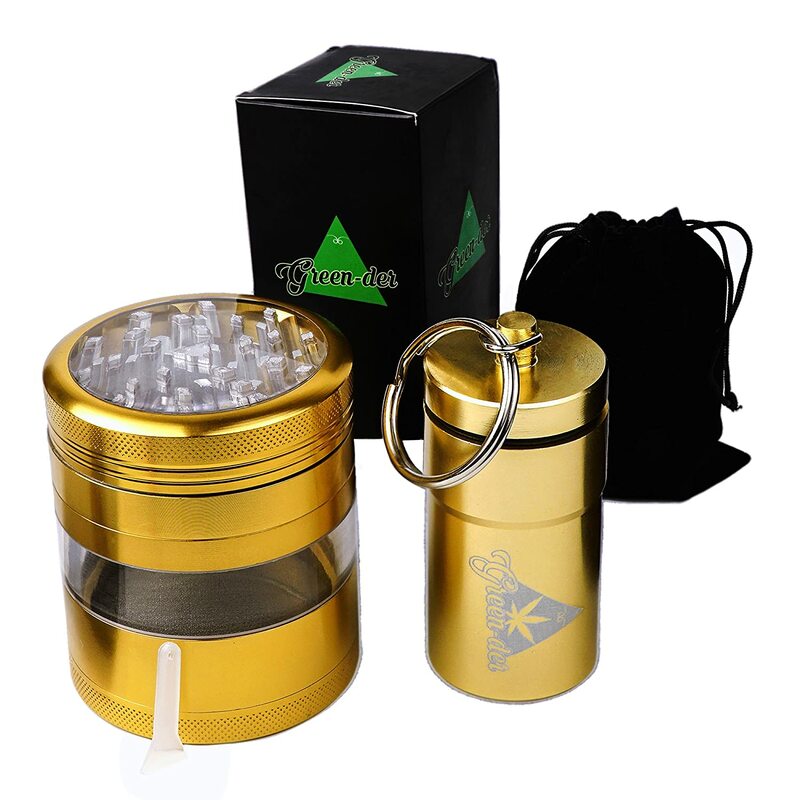 The 4 pieces this grinder come with are easy to use and work quickly to sort through the leaves and pollen and collect them in separate chambers. There is a clear chamber in the middle of the grinder which will help you to keep track of how much you have ground up. This chamber is also airtight so you can keep the ground up leaves in it without fear of odors escaping or the flavor diminishing. Before the leaves reach this chamber they will fall through a special pollen catcher. This catcher will remove any pollen from the leaves and prevent it from getting mixed into the freshly cut up leaves. You can start to grind the leaves up with the easy-to-twist lid which can be moved slowly but will quickly turn the teeth on the inside. This grinder comes with a keychain you can use on the grinder and a carrying bag you can store it in. 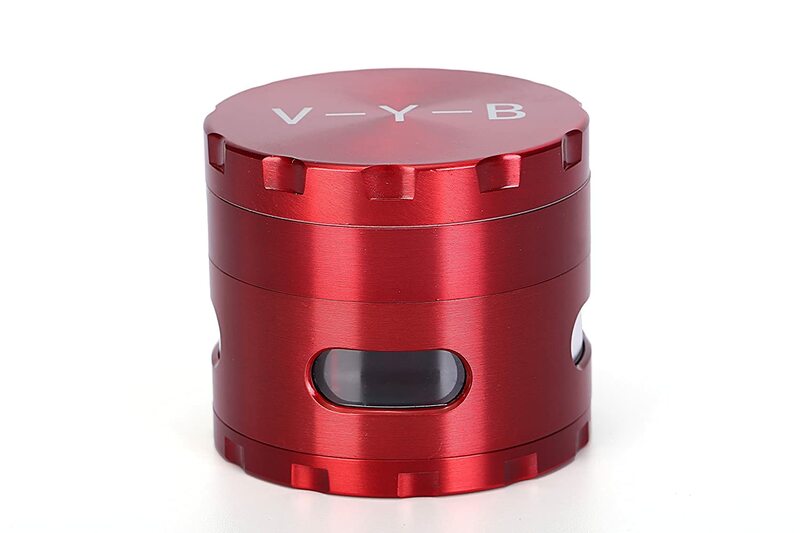 The Vayeebo Large Grinder measures 2.5 inches across and is made of a strong aluminum housing that’s coated in a stylish red color. If red isn’t a color you prefer for your grinder, there’s also black, blue, gray, green, and silver choices. This large grinder has a specially designed grooved lid which helps you to have a secure grip on it when twisting it around. There’s also a ring in the lid that helps to keep the movement inside quiet. Inside this product are numerous zinc alloy teeth which work to quickly grind the leaves up. There is a pollen catcher built into the grinder which will sort out the pollen and leaves to prevent them from being mixed together. To help you keep track of the amount of leaves that have been ground up, there are small windows located in the middle chamber. 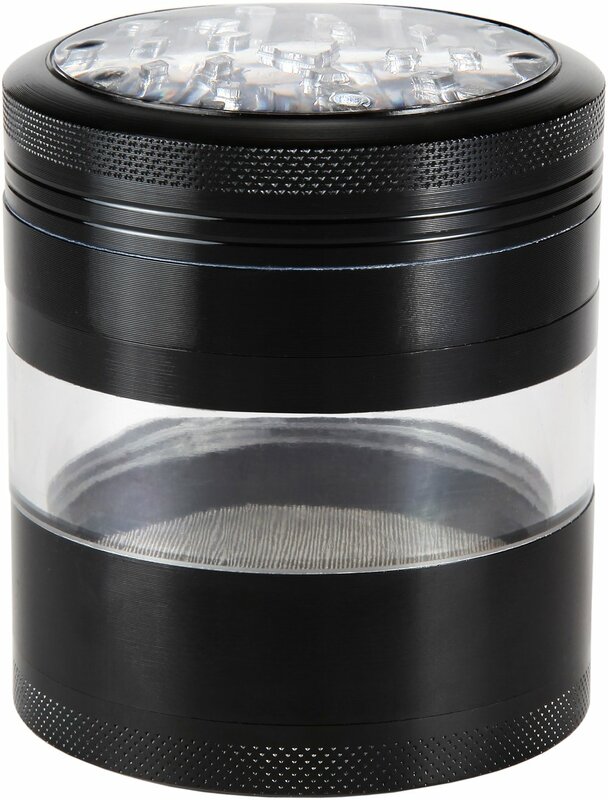 This durable grinder also has a stainless steel mesh filter in it to help with sorting out any other items that might be mixed in with your leaves. The Vaybeebo Large Grinder is also a portable option so you can carry it around with you. The Lincig Luxury Grinder is made of an aluminum housing that’s coated in a gray color. This grinder measures 2.5 inches across and is made up of 8 separate parts. One unique feature built into all of these parts is a CNC technology. This technology helps to keep the grinder durable and also quiet when being turned. The lid of this grinder works in quarter-turns so you don’t have to keep twisting it around constantly to only find a few leaves have been cut. Inside this grinder are sharp stainless steel blades which work to quickly grind up the leaves that you put in it. Once the leaves have been grounded up, they will fall into the next few chambers where they will be sorted out with mesh screens. One of these screens will work to separate the pollen out so it doesn’t get mixed in. This grinder comes with a carrying bag, cleaning brush, and a pollen scraper to help you remove any pollen in the pollen collection chamber. 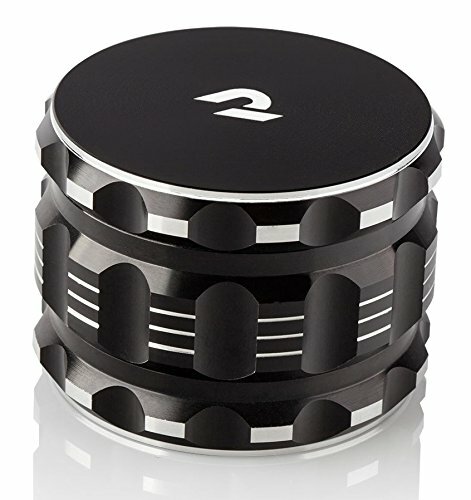 The Rocket Herb Grinder is made of an aluminum construction that’s coated in a stylish black color. The construction and paint are scratch-proof so you don’t need to worry about marks easily occurring on the grinder or the paint chipping falling off. This large grinder is composed of 4 pieces. The first piece is the lid which features magnets in it to help keep it secure to the grinder when you twist it around to grind the leaves up. Turning the lid around will activate the grinder’s extra-sharp teeth which will instantly grind the leaves up. These leaves will then fall into the chamber below where they’ll be sorted through with a micron-screen. This screen will remove pollen, hard stems, and other unwanted pieces from the leaves. The pollen will be removed and put into a separate pollen chamber. The Rocker Herb Grinder is airtight so no odors will escape from it. It comes with a pollen scraper you can use with the pollen catcher and a carrying bag you can use to transport the grinder around. These grinder brands are some of the top ones on the market for a reason. They make durable grinders at affordable prices which makes your investment worthwhile. Be sure to consider the different brands and their grinder designs to ensure you buy from the one that will best fit your needs.